An intimate dialogue between two friends and luminaries on love, death, and the spiritual path. We all sit on the edge of a mystery. We have only known this life, so dying scares us—and we are all dying. But what if dying were perfectly safe? What would it look like if you could approach dying with curiosity and love, in service of other beings? What if dying were the ultimate spiritual practice? 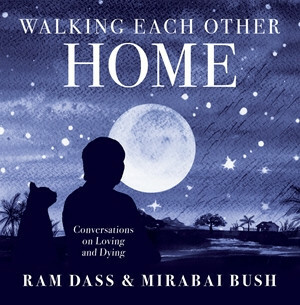 In Walking Each Other Home, readers will learn about: guidelines for being a “loving rock” for the dying, how to grieve fully and authentically, how to transform a fear of death, leaving a spiritual legacy, creating a sacred space for dying, and much more. “Everybody you have ever loved is a part of the fabric of your being now,” says Ram Dass. The body may die, but the soul remains. Death is an invitation to a new kind of relationship, in the place where we are all One. Join these two lifelong friends and spiritual luminaries as they explore what it means to live and die consciously, remember who we really are, and illuminate the path we walk together.